I finally finished reading every single one of the other BADD '08 posts! Yes, every single one (except the one in Turkish, sorry, couldn't get a translation). 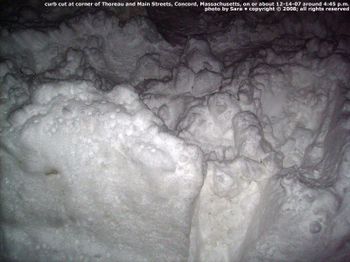 It took me five days, partly because like you I have a life which includes many other activities and responsibilities besides, alas, reading the internet, then partly because even though I have largely recovered from my amazing brain tumor experience, I still read a bit more slowly than I used to, and finally also partly because I am still apparently chock full o' cancer elsewhere, both the thought and fact of which are making me quite tired just at the moment. Also, this year people really had quite a lot to say! So many people contributed this year, and so many entries are long, detailed, erudite and/or impassioned, and all in all represent a heck of a lot of thought and work. They deserved not to be skimmed or skipped. 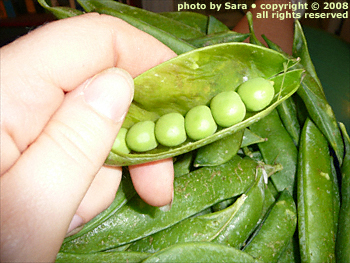 Yes, these are five pounds of organically grown English peas, in season. After I expressed how much I enjoy them every year, how hard it is for me sometimes to find them grown without persistent pesticides or chemical fertilizers, and how short is their season around here anyway, S. kindly set aside this amount for my pick-up and delectation. 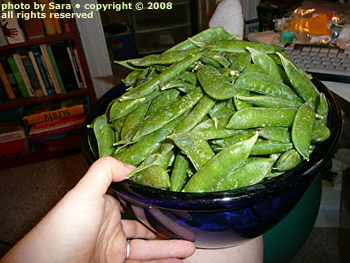 Yes, I eat them raw. They are sooooooooo good, better than candy and better for you to boot. 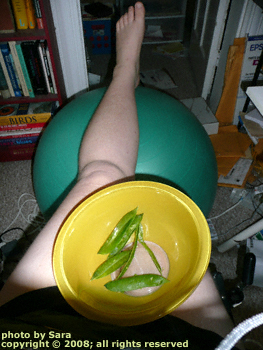 I ate so many yesterday that I created a friction sore in the righthand corner of my mouth just from running the split open pods across my teeth and tongue to slurp out all the green goodness within. So while I was making a pig of myself, and then again when my anxieties or our poor anxiety sausage of a cat woke me up untimely and I couldn't get back to sleep, I read and read and read. As I said, everything I read was worth reading, but here's a short list of my absolute favorites for people who have less time than I had because they sleep all night or who have less sustaining fuel readily to hand. Gigantic suffocating hugs go out to both The Gimp Parade and Planet of the Blind for pointing out that while war may or may not be precisely disablism, maybe not exactly, it is a tangible product of the same evil, the convenient ability to see people, even little children, not as individual human beings of unlimited potential but as so much expendable material. Special honors for best use of LOLcats go to OOK!. 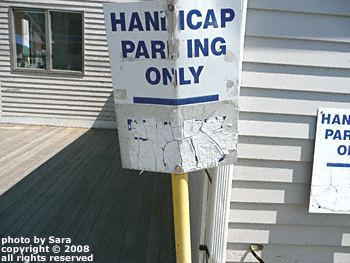 From An Unreliable Witness: Apparently, there are worse things than being disabled, including being forced to act as a professional inspiration to the masses, but at the same time being denied access to public transportation and public restrooms, and also having an anachronistic hairstyle. From This Is My Blog: You try living with a gorrilla in your house. From Twinkle, Twinkle Little Star: Very, very thoughtful and thought-provoking post about mainstreaming vs. segregating disabled children in educational settings. The writer draws from her own experience both as a disabled child in public schools and as an academic working to develop mainstreaming programs, a choice she is not entirely sure is always the right choice. Most revelatory line for me: "What is unique about most [kids with disabilities] is that they are born a minority into their own family." From Smite Me! : The closer we live our lives along the lines of relevant gender stereotypes, the more likely we are to be diagnosed with a personality disorder. Favorite part: "Schizoid personality disorder mainly comprises emotional and interpersonal distance – a main component of the male gender role. Narcissistic personality disorder seems to complement schizoid, in that it entails extreme ambition, arrogance, and a sense of entitlement. Along with antisocial personality disorder, the three disorders seem to embody the Western definition of masculinity." From A Garden of Nna Mmoy: The concept of "stereotype threat," about which I'd never heard before but which is apparently a hot topic. From it's THRILLING HEROIC:30, y'all! : A good example of a post detailing personal experience of debilitating chronic illness, just for people who didn't know what it's really like, plus my first exposure to Spoon Theory. 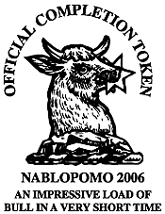 From Willendorf: Oppressors take note: the "Ladies' Auxiliary of the Gimp Militia" has been formed and is not amused by your sh*t.
From Lovely and Amazing: A nightmare turned into a pledge. I could go on and on, but at a certain point, as others have noted, a post like this just becomes a recreation of the directory. These are just the ones sticking in my mind right now, and I love them, but there were many others to love. If these don't look interesting to you, or if you run through them and find yourself hungry for more, you know where you can find more. Enough talking! What's for lunch? Yesterday was Blogging Against Disability Day. Over 100 people 1/ had already participated by the end of the day. I made my entry in the morning, and then, in between bouts of living my life, I read every single other one that had been posted by 1:00 this morning. It was good -- brilliant, sad, infuriating, hilarious, cathartic, even (dare I say it?) empowering -- but I am very tired. I need fuel! So let's have a sandwich. Let's all dine on a tofu submarine! A tofu submarine! Hey, a tofu submarine! If you are one of those people who dislike the mere idea of tofu, you should turn away now, because I'm not just going to talk about it, I'm also going to show pictures of it naked and then eat it. And look, I don't understand your problem, and I'm a little freaked out about it truth be told, but I'm me and you're you, and I am willing to keep an open mind and not judge you or make assumptions about you because of your tofu impairment as long as you don't get all up in my face about it and harsh my buzz. Okay? 'Cause I love the stuff. And I don't see any reason why I shouldn't be perfectly open about that, or why it should make anyone else uncomfortable. A tofu submarine is something I invented long ago when I was vegan. 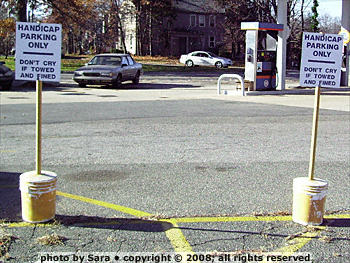 It's not just a life-affirming experience; it's also quite economical. A pound of organic tofu, loaded with nutrients including more iron than some cuts of beef, still costs less than two dollars most places (in very high-rent neighborhoods it might get up to three dollars) and makes a lot of sandwiches. The other ingredients are bread, butter or vegetable margarine, and raw, preferably organic vegetables. You can stuff yourself with delicious nourishment for about $3.00 a meal or less and then go for hours on the energy, even if you're a big person like me. It is better than you can imagine. It's the essence of freshness. I can eat nothing but this for weeks at a time and be blissfully happy. 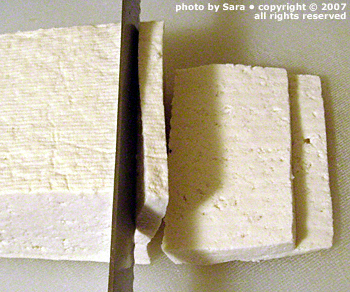 First, take a pound of extra firm tofu 2/and drain it thoroughly. Gently squeeze excess water out. Then slice it up thin (about 3-5mm thick). Next, select your bread. To make a true submarine, you will require a baguette of some sort or even a ficelle. Sourdough works better than French, though French will do if it has to. The very best choice is some kind of embellished sourdough, like a four-seed sourdough or a rosemary-garlic. Whatever's in the bread will only add that much more flavor and texture to the sandwich. 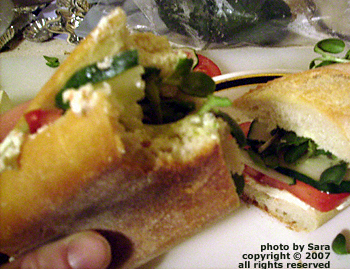 You can also make every bit as good a sandwich using ciabatta or slices from an artisan loaf. One of my local favorites for this purpose is the Nashoba Brook Bakery's olive loaf, containing kalamata olives and caramelized onions. The resulting sandwich won't be a submarine, of course, but it will be just as delicious. You just don't want to use ordinary grocery store bread, nothing flimsy or squishy, and nothing with corn meal on the bottom. You need something with substance and flavor, for physical structure and for dimensional taste. If you're using a baguette or a ficelle, cut yourself off about six or eight inches, depending on how hungry you are. Slice the bread in two lengthwise. Now, whatever kind of bread you're using, butter it. 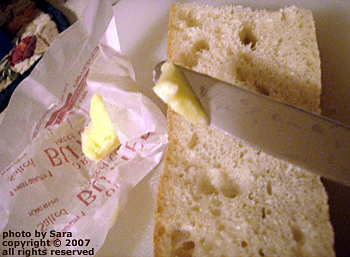 3/ Butter it very lightly using softened salted butter or easily spreadable margarine. Very lightly. You do not want globs of fat coating your tongue, interfering with all the lovely freshness. You just want a little moisture to hold the bread onto the filling, and a little nice buttery flavor to complement the tofu. 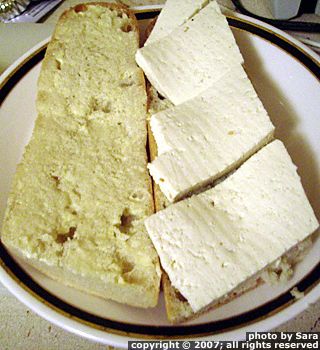 Spread slices of tofu over one buttered half of your sandwich. Don't double up like with lunch meat; one layer will suffice, and more will be too much. Also, trim the tofu to fit the bread. This isn't the kind of sandwich that's enjoyable if the "meat" is flopping out the sides. If you like, and sometimes I like it very much, you can grind some pepper over the tofu at this time. You could, alternatively, choose to grind pepper onto the butter before you apply the tofu. You won't need salt because you have salt in the butter. Now you'll want to consider your veggie choices. You can use pretty much any raw veggies you like, but certain ones will be sensational, and certain others are so good that if you just have one or the other of them, you don't even need the others. 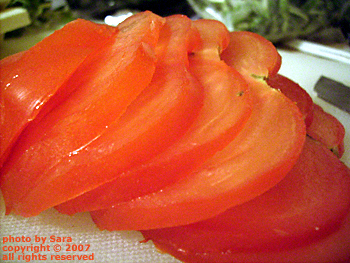 Tomato 4/ and cucumber slices fall into this latter category. The order matters, if not the exact ingredients. If you have tomato, it goes first on top of the tofu. 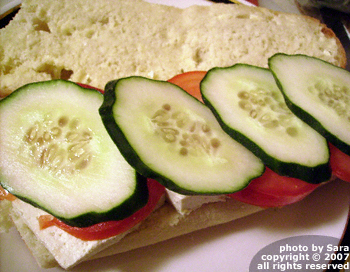 Then comes the cucumber, if you have some, which you cut at a slant to get long slices. Then come sprouts, if you are using sprouts. 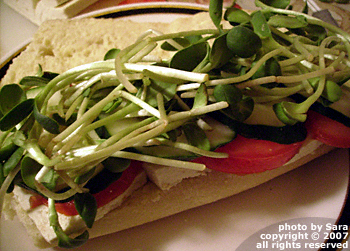 If you are using sunflower sprouts, which is one of those ingredients that can make this sandwich sensational instead of just yummy, they should go on after any smaller sprouts like clover or radish. Lettuce, if you are using lettuce, goes last. 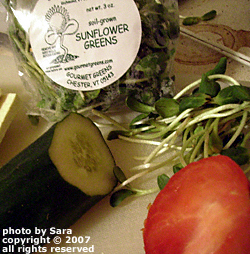 My essential favorite combo is tomato, cucumber, and sunflower sprouts. Heaven in my mouth. I also like to throw on a good watercress when I can find it, and mixed clover/radish/garlic sprouts. I usually don't use lettuce on this sandwich, even if it's the only green I have, just because I don't feel it adds much. Other really good things to throw on include sliced black olives on top of the tomatoes or grilled (or well-drained sautéed) mushrooms underneath the tofu. (The mushrooms will add extra protein, too.) Sweet red pepper under the sprouts. 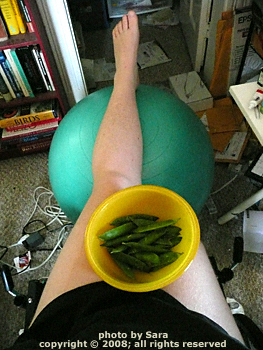 Pepperoncini anywhere if you used salad dressing or olive oil instead of butter. Salsa instead of salad dressing, tomatoes or butter. Onion, raw or caramelized, under the tofu if you swing that way. The fridge is the limit! 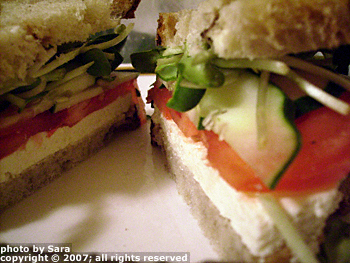 Now you close the sandwich, then cut it into halves at a slant so you can fit it into your mouth for biting. Now you take yourself off to a private place where you can gorge on this like a lion on a hyena belly. Or you make a second one for your true love or other dining companion, and bring lots of napkins to the table. Things can get a little damp and messy from here. 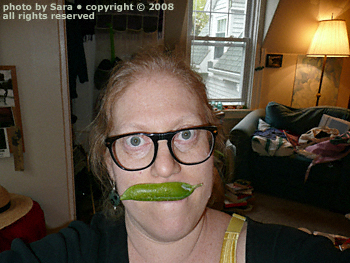 See, eating vegetarian does not mean you can't get your savage on. Sometimes, when you pause to take a sip of chilled herbal tea with the sprouts in your teeth and tomato juice running down your face, it feels good, real good. 1/ Many brilliant and moving things were published, but my absolute favorites for clarity and wit were Lady Bracknell's and Humdrum's entries. Dream Mom, Emily Elizabeth, and David touched me deeply. Penny just plain creeped me out (which is not a criticism, just a description). And that's just six off the top of my head. 2/ It has to be extra firm. Any other consistency will be too mushy, though I have made do with just firm in an absolute pinch. If you have a source of freshly made tofu, use that. If you've never tried freshly made tofu, try to find out if there is a tofu shop in your area, a place where they actually make tofu on the premises. As much as you may already like or even love tofu, the freshly made stuff is a whole other thing, a potentially amazing and delicious thing. I used to frequent a place in the part of San Jose, CA, known as "Japantown." I do not remember the name of it, but it was basically a couple of young guys who did nothing but make huge vats of tofu all day and sell it by the pound. Great stuff. Can't recommend it enough. 3/ I used to use Weight Watchers brand margarine. It was the perfect margarine, except I think upon reflection that it had kind of a lot of hydrogenated and/or partially hydrogenated fats. It was all vegetable, though, very low fat and sugar, practically melted at room temperature (always a good sign in a fat you're going to ingest), and even though you weren't supposed to be able to, I cooked very well with it, even baking and sautéing. I haven't seen any in a store on this coast since 1996, though, and I have never found a substitute that tasted and felt on the tongue as much like actual butter, so I have no recommendations at this time to make for a margarine. But I will say that butter should be okay for you, even if you're counting calories, unless you can't or don't want to do dairy. Just don't overdo it. One of the things I've learned over the years is that it's not so much ingredients like butter, sugar and eggs that are inherently bad for you as how little we control our intake. We can't just eat whatever we want, as much as we want, whenever we want and not suffer consequences. However, I do not believe that most people are going to gain weight or damage their vascular systems if they eat three or even four of these sandwiches a day as long as they aren't overeating other foods in the same day. In three or four of these sandwiches all together, I might use a whole tablespoon of butter (11 g fat, 7 g of which are sat. fat, 100 calories, 115 mg sodium). You really only need a tiny amount, half a teaspoon at most per piece of bread. In fact, too much is gross. This is how much I used for a slice and a half of olive bread today, and it was almost too much. 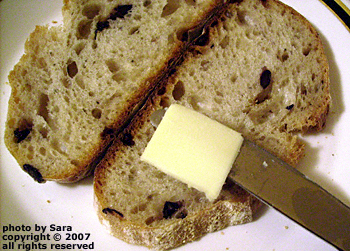 Of course, you don't have to use anything butter-flavored at all. There is just something particularly wonderful about the way butter flavor melts into tofu flavor, giving the tofu an almost eggy quality. So why not just have a fried egg sandwich? Well, for one thing I was vegan when I came up with this. Also, though, a serving of tofu has 183 calories, 11g protein, 11g fat (2g sat. 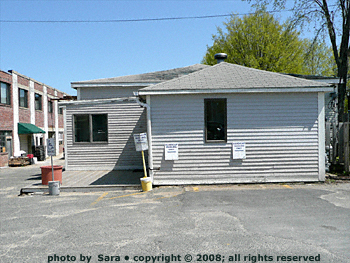 ), 5g carbohydrate (3g fiber), and zero cholesterol, whereas a fried egg has 90 calories, 6g protein, 7g fat (2g sat. ), zero carbohydrate, but 210mg cholesterol. I'm not comparing exact weight measurements, so I could be assessing inaccurately, but these kinds of numbers do make me think tofu has a better potential energy to bad stuff value (an actual scientific ratio, that), even when you leave out the fact that the fried egg has 5% RDA of iron, whereas the tofu has 19%. However, if you like, you can use a super-tiny amount of cholesterol-laden (but delicious) mayonnaise, this stuff called Nayonaise (a soy-based mayo substitute that tastes a lot like Miracle Whip) or some other mayo substitute, some other salad dressing of your choice, or just brush on a tiny amount of extra virgin olive oil which you can also sprinkle with oregano. All these things are good, too. It's just a matter of personal taste and personal nutritional goals. 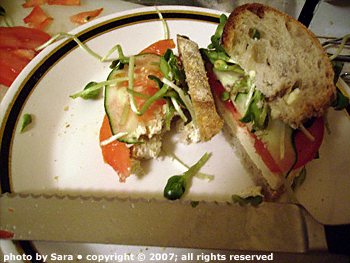 4/ Roma tomatoes cut lengthwise are outstanding in this sandwich, but any kind big enough to slice will do. 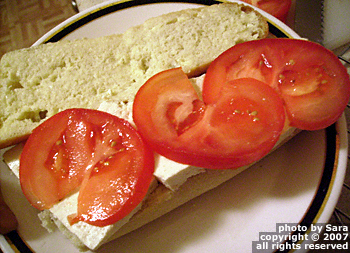 In a pinch I have even split open grape tomatoes but not completely separated the halves, just scattered them around split open onto the tofu, then smacked more layers or the other piece of bread on top and called it a sandwich. They're very tasty, but they tend to fall out while you're eating more frequently than big slices of larger tomatoes.